Do you have a support network to catch you if you fall? How many pay cheques are *you* from homelessness? 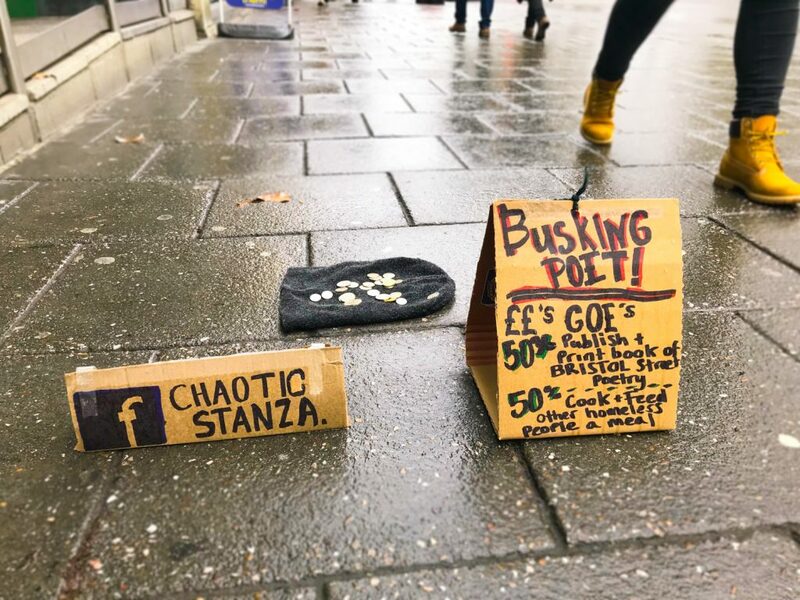 Today I’m writing to ask for your help raising money to get Anthony the homeless poet off the streets and fund his dream of helping other people in his position. Last Wednesday I was in Bristol city centre early to go to the Post Office before work. Walking along near Castle Park, I gave £5 to a man sitting on the pavement near Starbucks, and found myself drawn into conversation with him. A trained chef, on the streets after losing his job and attached accommodation, he had a notebook set out in front of him. Anthony had started trying to make sense of his situation by writing poems about the people he was meeting throughout the day. Despite having had his bag stolen (containing his work clothes, phone, bank cards and ID) he seemed unbelievably relaxed and philosophical but it was bitterly cold outside and I thought about him all morning, kicking myself for not giving him enough money to at least spend the night in a hostel. At lunchtime I hurried back to see if Anthony was still there, keen to find out if there were any practical things I could do to help. Giving money to people for hostels or food feels better and more direct than going through other channels, but is only ever a sticking plaster for a much bigger problem. He was happy to see me again and I sat down on the step with him for a while, talking everything through. Anthony is only recently homeless, having just returned to Bristol from working in another city. He doesn’t do drugs, doesn’t even drink much, and feels safer sleeping in a doorway on a busy street than in a hostel. He’s also saving money from public donations to buy new chef’s whites so he can work, so doesn’t want to “waste” the cash he’s given on accommodation as it’s so incredibly hard to save up any meaningful amount. I was surprised to hear that £215 – an achievable sum of money for someone in employment to save up relatively quickly – would cover all the clothing and equipment he’d need, but of course that was only one of the issues keeping Anthony out in the cold. I asked what the main barriers were to him getting back into work and he said two: his lack of work clothes, and somewhere to have a shower and sleep so he can be presentable for work. Having no address means it’s way harder to apply for a new bank card and ID, impossible to get a mobile phone contract…simple things we take for granted. Without somewhere to stay he can’t keep a job, and without a job he can’t get the money to get a place to live. What a cruel catch-22. On Thursday and Friday nights I took my live band along to Manchester’s Deaf Institute and Bristol’s The Exchange to support alt rock band Lonely The Brave. I’d given Anthony my number and asked him to send me a wish list of things that would be useful to him. I knew a smartphone would enable him to start looking for work, so my husband Tim dusted off an old one from a drawer and I arranged to pass it on that Friday along with a rucksack and a new toothbrush. We’d also talked quite a bit about poetry and performance, and Anthony had said he wanted to get on stage one day, so it was a simple thing to invite him to come along to the Bristol gig and read a couple of his poems at the end of my set. I wanted to share the platform I’ve carved out for myself from a position of relative privilege with someone who was currently reduced to being ignored by thousands of people every day. Despite having never read his poetry on stage before, Anthony aced it. I’m so grateful to Lonely The Brave’s audience for being so welcoming and encouraging, and there was a real beauty and power to watching this humble man command the full attention of nearly 200 people. After the gig we managed to raise about £80 to go towards replacing Anthony’s work clothes, and a couple took him home with them that night so he could get a proper night’s sleep and have a shower. We met up again the next day to talk about what could happen next. Though Anthony continued to ask for absolutely nothing, I decided to pay to put him up in a private hostel room for 7 nights to give him time to rest, regroup and have a chance to take the next steps towards getting his life back. I just couldn’t bear the thought of someone I was becoming friends with laying his head in a doorway to sleep. It’s my belief that a quiet, private, clean living space is a basic human right and it felt good to do something meaningful for someone. Unfortunately I’m not in a position to do anything more than this financially, which is why I’m turning to you. We can’t help everyone, but that doesn’t mean we shouldn’t help anyone. I’m not a religious person, but I have the phrase “There but for the grace of God go I” on a loop in my mind at the moment. If we truly let ourselves feel all the pain and sadness in the world we wouldn’t be able to function, so of course it’s easier to lower our eyes and scurry past the person asking us for help. It can feel hard enough to balance our own financial lives without even starting to think about other people, but if Anthony’s story has touched you at all I would really appreciate your donation, big or tiny. “So I found myself on the streets, not for the first time in my life. Hopefully the last, but one cannot always know what with possible down turns in economy, redundancy etc. Something that could happen to anyone really. What brought me here? Well, at 13 I was on the streets for a year or so. Luckily it’s equipped me for this recent outing! Basically from a broken violent home I went into Care. This didn’t define who I was, just what hand I was dealt. At 16 I went into a kitchen and found I had a gift. I love food – like music it can bring the masses together in a harmony of flavours (or sounds). Throughout my life I have also enjoyed words, of the poetry kind. But never really followed it through. Anyway, back to why I’m here. Basically, I lost a dear person who meant a lot to me last year. Depression hit, I was frivolous with money and didn’t care for the next day. Being self employed and having my accommodation tied to my job, I lost my job. Which then meant I lost my flat. I found myself on the streets of Bristol. Having my bag stolen on night one left me without my uniforms or tools to work let alone a change of clothes or a phone! I have since had a total retake on how I view people, the world and life. I have found my love for poetry and embraced it, and have been lucky to have had the chance to share it. I so badly want to return to work. My dream which keeps me positive is to have a barge or boat, which can ultimately be a bistro by night or cafe by day, with the profits going to then feed the homeless. Or even to franchise/rent a cafe in the evening when not in use so we could use it to make money to use the profits to feed the homeless. My situation may seem severe but I believe that me going back to work will also potentially blossom into something many more people will benefit from. I believe in the goodness of fellow humans. If we all take 5 minutes of our days to put into society, not to just the homeless but the old lady down the road or the lonely guy next door with no friends, a smile to a fellow person or five mins chatting to a stranger that looks upset. We have a duty to give, not ignore. To build the society we live in from the inside out. Bristol is unique and gorgeous. Just think of how good we could really make it. If we could raise £500 it could cover all Anthony’s basic needs to get back into work plus give him a nice treat of a year’s supply of Moleskines so he can keep writing poetry (12 x £10 = £120). BUT without somewhere to stay while applying for jobs it will be impossible for Anthony to stay off the streets, so I’m also hoping to raise more money to keep him safe in his private hostel room for a few weeks. When I first suggested this crowdfunder to him, he said he just wants to be able to get a job, save up and make a plan to settle somewhere, but after a few days of safety and security in the hostel he’s feeling more ambitious and has already started setting up meetings to make his dream to feed the homeless a reality. It’s inspiring to see. I truly value the time we’ve spent together over the past week and just hope I can help get him back on his feet. Thank you so much for reading. If you’re able and happy to donate – thank you again! Finally, if you know of any jobs or accommodation in Bristol which might be suitable for Anthony, we’d love to hear from you. Let’s bring someone in from the cold this winter. Pingback: She Makes War | Anthony update – he’s off the streets!